Aim: This study aims to find out which market dynamics are currently relevant for accounts receivable levels (specifically overdues), and how lessons learned can be used by credit management. Design / Research methods: The unique research strategy is characterised as a single case study with design elements at two country units of a company to be named FEED. The classification and overview of relevant market dynamics provide valuable insights for determinants and intercompany differences in receivables, and whether these arise at the country or market level. Conclusions / findings: The classification and overview of relevant market dynamics provide valuable insights for determinants and intercompany differences in receivables, and whether these arise at the country or market level. Originality / value of the article: The findings suggest adjustments of the literature in that the interest rate is currently not a relevant factor. Moreover, instead of focussing on costs of capital, an emphasis on default risk is more applicable nowadays, and hence researchers should focus on overdue instead of on receivables in general. Aim: The objective of this paper is to make comparative analysis on operational efficiency between Chinese and Indian commercial banks (CBs). Design / Research methods: Following the previous scholars’ study, two models with different sets of input and output variables have been used to show how efficiency scores vary with change in inputs and outputs. The efficiency scores are measured by using data envelopment analysis (DEA) approach. Conclusions / findings: The mean technical efficiency score of Chinese CBs is always relatively higher than the corresponding score of Indian CBs in 2012-2013, respectively. In terms of technical efficiency and pure technical efficiency, the performance of foreign banks in China is always relatively lower than that of foreign banks in India. Originality / value of the article: While many similar studies have evaluated the performance of banking industries in different countries, very few studies have evaluated the performance of banking sectors between Chinese and Indian economies. 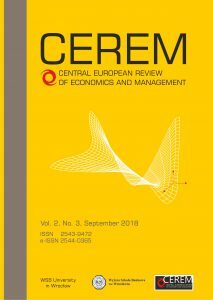 The paper would be of interest for OR scholars and practitioners in financial industry. Implications of the research (if applicable): The next step of this study could collect more samples and use Malmquist index method to conduct further study on efficiency, efficiency changing and productivity, in order to conduct further competitive power analysis on both of banking industries of China and India. Key words: Data envelopment analysis, Commercial banks, China, India. Aim: Indian Pharmaceutical Industry (IPI) has undergone a massive makeover–from a modest beginning of “process patents regime” in the seventies to a modern and WTO compatible regime under the Trade Related Intellectual Property Rights System (TRIPS) in 2005. This paper estimates Total Factor Productivity Growth (TFPG) of Indian Pharmaceutical Industry (IPI) using firm level data from 2000 to 2013. Design / Research methods: We have used nonparametric approach of Data Envelopment Analysis (DEA) using Biennial Malmquist Index. Conclusions / findings: The results of estimation suggest an increase in overall TFPG of IPI after TRIPS agreement and also those vertically integrated firms involved in both bulk drugs production and formulation activities are less productive compared to firms that are involved in production of only bulk drug or formulation activity. Originality / value of the article: This paper examines whether productivity of IPI has increased after 2005 i.e. after the period of TRIPS, by estimating TFPG for two sub-periods, i.e., from 2000 to 2005 and 2006 to 2013. Implications of the research: The decomposition of TFPG suggests that for overall period 2000-2013, scale changes are the most important factor causing the productivity changes and among the other two alternative sources of TFPG, efficiency change dominates over technical changes. For the sub-period 2006-2013, the improvement in the scale efficiency may push the firms to a higher TFPG, whereas for 2000-2005 the better utilization of factors of production is the main driver of TFPG. A second stage panel regression suggests that R&D expenditure, Marketing expenditure, Market size, Capital-Labour ratio, import intensity and export intensity have positive and significant influence on TFPG. Key words: Total Factor Productivity Growth (TFPG), TRIPS, Indian Pharmaceutical Industry, Data Envelopment Analysis (DEA), Biennial Malmquist Index. Aim: The purpose of this paper is to examine the productivity of 12 container ports located in East and Southern African developing nations for the period of 2014-2016. Furthermore, to investigate the sources of productivity change over the time period. Design / Research methods: This research collects data on the 12 container ports. The productivity of these ports is analyzed using the Data Envelopment Analysis based Malmquist productivity index. This is decomposed into technological changes and technical efficiency. The sources of productivity change are identified. Conclusions /findings: The major finding of this study is the trend in the port efficiency level over the three year period of analysis. Therefore assisting maritime policymakers and port authorities on what aspect of the port production need enhancement. Originality/value of the article: Evaluation of ports in developing nations in Africa is not common. Also, the year under examination is less than five years. Therefore the result is relevant to port authorities as well as to the African nations. Implications of the research: 90% of import and exports into developing African nations are done by sea. The implication of this is that an efficient or inefficient port will have a multiplier effect on the nation’s economy. Great improvement in port productivity will enhance economic growth and development. Limitations of the research: Port efficiency should be evaluated on a yearly basis to serve as a major determinant of port productivity. However, this evaluation is based on availability of data. Key words: Ports, Data Envelopment Analysis, African Nations, Developing, Malmquist. Aim: The main objective of this research was to evaluate the efficiency of economic costs in seven units of greenhouse tomato production, during the production cycles of 2016, through the application of the stochastic frontier, depending on the type of packaging they handle and the cost structure that governs them. Design / Research methods: The stochastic frontier model includes the analysis of the non-systematic random component, which assumes an extremely critical role in the analysis during the interpretations. With the calculation of the stochastic cost frontier we construct the cost inefficiency index represented by C_it, delimited below 0. The index shows the percentage in which the cost is exceeded and, therefore, the degree of inefficiency. Conclusions / findings: The elaboration of the stochastic frontier finds its justification in the argument that the less efficient competitor is the one that receives the greater effects of the competition. In this sense, the location of the companies analyzed with respect to their own line of efficiency is essential for the design of the strategies of each company. The production units analyzed showed that, on some occasions, externalities are the cause of inefficiency, but contrary to what is established in theory, there are some units that show that the inefficiency with which they count is diminished by The influence of uncontrolled variables. Originality / value of the article: The contribution of this research lies in the use of efficiency models in the primary sector, specifically in tomato´s greenhouses.. Aim: In spite of investments in new technologies to improve upon rice production in Ghana, productivity levels are still low. It is therefore important to assess the efficiency of farmers and identify sources of inefficiency to develop policies to reduce inefficiencies. This paper aims to investigate the extent and drivers of technical efficiency of rice farmers in Ghana. Design/Research methods: bootstrap data envelopment and restricted single-stage stochastic frontier models are employed to examine the technical efficiency of farmers and its determinants. The data for empirical application come from a farm production survey comprising a total sample of 197 rice farmers in Ghana. Conclusions and findings: The analyses revealed on average, farmers are about 65% technically efficient. This result indicates that there is a potential to improve upon technical efficiency of farmers by about 35% within the existing state of resources and technology. Furthermore, the drivers of technical efficiency were identified as food insecurity status and membership of farmer based organisation. Specifically, the results show an inverse relationship between food insecurity status and technical efficiency; where higher levels of food insecurity are associated with lower levels of technical efficiency. Also, membership of farmer based organisation increases technical efficiency of farmers. Contrary to previous studies, non-farm income and credit access were not identified as significant drivers of technical efficiency among the sampled farmers. On the basis of the findings, policies should aim at reducing food insecurity among farmers and encouraging membership of farmer based organisations. Originality/value of the article: This paper provides evidence-based information on the extent of technical efficiency of rice farmers in Ghana and suggests measures for technical efficiency improvements. Aim: In this paper we are looking at the seaports (in India called ‘major ports’) from the context of its trade and India’s strategic importance in trade world after the initiation of economic reforms in 1991. It empirically estimates the levels of productivity and efficiency of seaports in India. This paper applies DEA technique to assess productivity and efficiency of seaports in India. Design/Research methods: DEA technique is extensively used in the literature of economics to provide measures of firms’ technical efficiency. These measures rank the firms by looking at their apparent performances over a period of time. DEA is a frontier model which is non-parametric since no functional specification or form is required to be mentioned. Conclusions/Findings: The DEA results as discussed and reported in the paper have shown how Indian ports are performing over the years. This investigation alone is not sufficient to develop a benchmark in the port system of India. Rather it will do well to have a closer look at the Indian ports from the physical and financial performance point of view. This study made use of data envelopment analysis (DEA) to generate what we call an efficiency benchmarks and assessment of the Indian ports sector. With this modest attempt to investigate the port sector of India several issues are in the open one can further analyze and come to desired conclusions. Originality/value of the paper: The main role of a port is to transfer goods between two transport modes. As far as Indian ports are concerned, there are few studies with regard to productivity and efficiency of the port sector. Since, there is an attempt in recent years to overhaul the infrastructure sectors of the Indian economy and especially seaports. There is a need to look at issues in port sector as well. Productivity and efficiency concerns should be the main aspect of the benchmarking of the performance of today’s Indian ports. Limitations of the research: Second stage DEA, distance function approach, Bayesian techniques, Carlo Monte techniques, can be alternatively used. Key words: Productivity, Efficiency, Frontier, Parametric, Non-parametric, DEA. Aim: The aim of the article is to show: 1) that the reasoning of perfectly rational players presented in 1994 by the author of the Traveler’s Dilemma Kaushik Basu is incorrect and therefore leads to wrong conclusions, 2) how the reasoning of these players should look like and what solution it leads to. Design / Research methods: Logical analysis. Originality / value of the article: A new way of making decisions in the Traveler’s Dilemma game. Implications of the research: A new way of making decisions in other games similar to the Traveler’s Dilemma may allow to find new solutions in these games. Limitations of the research: The described decision-making method can potentially be used in decision-making situations when the following five conditions are met: 1) the set of possible decisions of each player is greater than 2, 2) the winning matrix is known to both players and both know the purpose of their choices, 3) when it is played once with an unknown opponent, 4) when both players have to make their decision without knowing the opponent’s choice, 5) when there is no decision, which is a stable balance point or when it is, but its choice means that the player does not achieve a satisfying result. Key words: game theory, Traveler’s dilemma, perfectly rational player, backward induction.